Enjoy the best in shooting games. Single or multiplayer. Zombies or criminals - you decide. Lowest prices guaranteed, free delivery, backed by award winning service. With our range of shooting arcade machines you can have all the excitement of an authentic shooting arcade game in your own home, or you can buy these classic games for a commercial environment. They are always the centre of attention and friends, family and customers will never get sick of these famous games. These games are endless fun whether playing solo or with a friend, and are great games for onlookers and crowds of friends. They have all been refurbished to an excellent standard and will always be a centerpiece of attention, wherever you put them. These arcade machines are usually available from stock. They will be held in storage currently. We will remove your choice of machine from storage and undertake the refurbishment process. We will replace any damaged or missing decals. Your machine will be thoroughly cleaned, and once the refurbishment process has been completed it will be soak tested to ensure it plays perfectly. This process usually takes a total of 2 to 4 weeks to be completed. Please note that some small signs of cosmetic wear may still be present, simply due to the age and previous use of these machines. 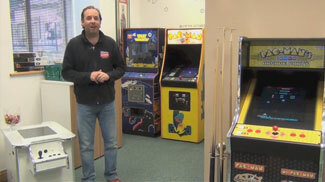 We provide a 12 months parts warranty and 6 months commercial parts warranty with all of our vintage arcade machines. This doesn't cover accidental damage or mis-use. It is important to allow arcade machines to power-off fully before re-starting as this can cause issues loading the software. Also we recommend indoor use only. Garages can be too cold and damp for arcade machines to function correctly.